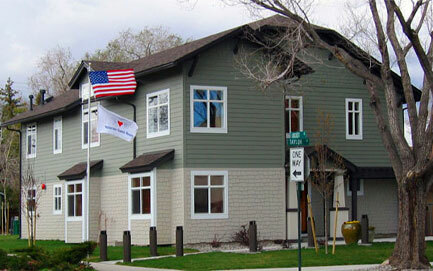 The Veterans Guest House has a long history as the best-kept secret in Reno. The “Home Away from Home” is the only facility of its kind in the country serving U.S. military veterans in the way it is done at the Veterans Guest House. The House is privately funded and receives no government funding for its operations. In the early 1990s, veterans visiting the Veterans Administration Medical Center of the Sierra (VAMC) early in the morning noticed that windows of cars in the parking lot were fogged up. This meant only one thing—someone had spent the night in their vehicle. One morning a woman was exiting one of these cars and the concerned veterans asked her about her situation. Her husband was in the ICU. She and her children had spent the night in their car because they had no other option. These veterans said, “never again on our watch will this occur.” This is when the idea for the house began. The Veterans Hospital Foundation received its 501(c)(3) status from the IRS in 1992. In 1994 the Reno “Spouse House” was opened. It would soon become apparent that veterans needed this support as well. The original 1935 bungalow located at the corner of Locust and Taylor (880 Locust St.) housed veterans and family members for the next ten years. It had 3-5 beds, depending upon the year, and prior to it being raised was providing 800-900 guest nights of lodging a year. In 2002, the organization changed its name to Veterans Guest House, Inc. and in 2004, with the help of the community, a new 12-bed home was built. Usage grew and the house did, too. In 2012 a second house located adjacent to the existing one was opened bringing the bed total to 17. In 2016, occupancy numbers exceeded 5,300 guest nights. The two homes are basically full year round.